A Backpack to die for! I once sat working on a presentation in a coffee shop at a table next to a group of women. I was in the coffee shop for close to 90 minutes, and for the duration my neighbors animatedly discussed handbags. Different brands, colours, pros and cons, sizes, materials. I was amazed. When I escaped to my car I wondered to myself what I could have contributed to that conversation. I have a 1L Sea to Summit dry bag which I use as a handbag for money and bank cards. It’s a very pleasing and versatile shade of blue. It’s the only one I have. I could imagine the stunned silence. Frivolous creatures, I thought dismissively as I reversed my bakkie with more vigor than strictly necessary. As I continued to muse on this subject, it struck me that I was not being entirely fair. I mean I could speak about backpacks for a week! Fit, comfort, carrying capacity, shoulder straps, waist straps, front pouches etc etc. Just the other day some running mates were at a Wild Coast hotel on a multi day run and were languishing around the pool discussing bladders. “My bladder can take 3L! Why do you have such a small one?”, “Eish, I have been having such trouble with my bladder, its leaking and I cant find the problem.” “No ways, mine too. I think there something wrong with the seal!” “My bladder was still half full at the end of today, I think I am carrying too much.” The other patrons started edging away and looking nervously at the pool for telltale signs of leaking bladders. So, although I have little to contribute to the handbag conversation, I am fully qualified to talk about packs (and bladders!) Having tried many very good, mediocre and very bad packs in all sizes over the last 10 years of trail running, from 5L day packs to 30L multiday packs I consider myself an authority and have the saddle sores and chafe marks to prove it! 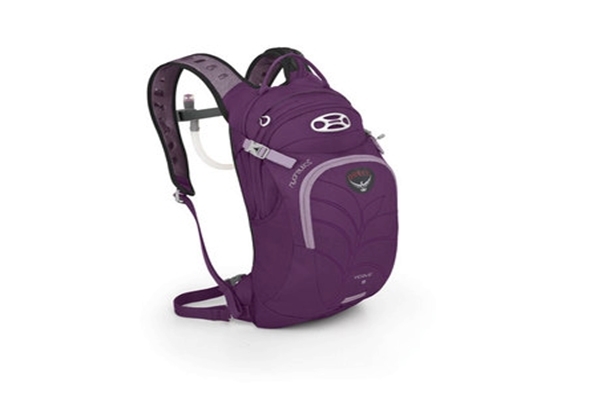 My 9L Verve women’s fit Osprey pack with 3L bladder is an absolute winner. I have never worn a pack flat-out for 3 days and returned without chafe marks. The fit is unprecedented. The comfort is amazing. I ADORE the magnetic clip that keeps the drinking valve in place. The mesh back is cool and airy and totally comfortable. It has just the right number of compartments and pouches to conveniently house all my necessities. The built in dry bag top pouch is perfect for cell phones and bank cards. The rigid backed 3L hydration pack is a brilliant design and fits easily into the pack, even when it is full. It is extremely easy and convenient to fill on the move and has a great seal. This pack so ticks all the right boxes for me. In addition to all that it is also extremely good value, especially taking into account that the hydration bladder is included in the price. It’s a backpack to die for, Darhling! I am totally looking forward to trying out the bigger packs for multi day events.